(a) Check for continuity of the antenna. Check for continuity at the center of each antenna wire as shown in the illustration. When cleaning the glass, wipe it in the direction of the wire with a soft and dry cloth. Take care not to damage the wire. Do not use detergents or glass cleaners with abrasive ingredients. 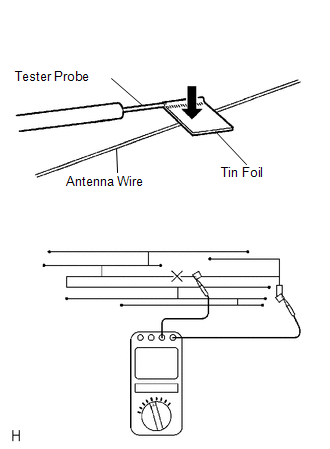 When measuring resistance, wrap a piece of tin foil around the tip of the negative (-) probe and press the foil against the wire with your finger, as shown in the illustration. There is continuity in the antenna. If the result is not as specified, repair the window glass antenna wire. 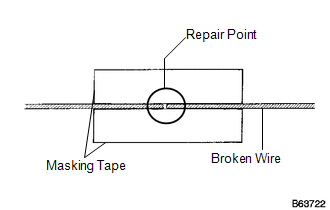 (b) Place masking tape along both sides of the wire to be repaired. 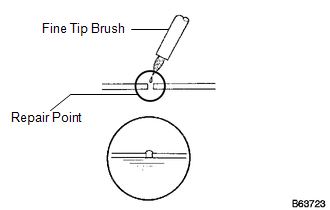 (d) Using a fine tip brush, apply a small amount of the repair agent to the wire. Do not repair the antenna wire again for at least 24 hours.